When your 13.1 race is a month away—but you haven’t exactly been “training”—this plan is perfect. 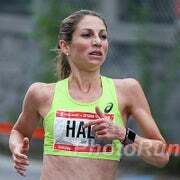 Heather Colasuonno was in the best shape of her life while training for the 2014 Toronto Waterfront Half Marathon when she was sidelined by an Achilles tendon strain. The 30-year-old wife and mother from Ajax, Ontario, couldn’t run for more than a month and returned to the roads just six weeks before race day. Nevertheless, Colasuonno made the best of the training window she had left and ended up coming within seconds of matching her fastest half-marathon ever. Runners like Colasuonno are living proof that it is possible to “crash train” for a half marathon. Whether it’s an injury, an illness, work stress or scheduling that threw you off track, four to eight weeks is enough time to prepare for a successful 13.1-miler provided you’re healthy and able to train without further interruptions. The key to crash training is building fitness quickly without taking big risks. The best tools for fast fitness are frequency and intensity. Doing some kind of cardio almost every day—whether that means running, walking or cross-training—will help you make the most of the time you have. And a couple of those workouts each week should include high-intensity effort, which is proven to stimulate quicker physiological adaptations. This plan is perfect if your goal is to walk or walk/run a half marathon that is four weeks away and you’re currently fit enough to comfortably walk/run 5 miles. Like This Article? Try One Of These!